The Mars Hoax: Mars Spectacular! As Big as the Moon...Not Quite! Mars Spectacular! Otherwise Known as: The Mars Hoax! 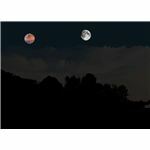 The emails exclaim: Mars, close enough to be as big as the full moon in the night sky! No one alive today will ever see this again!! Don’t you believe it!!! The Internet is a wondrous place: Almost infinite amounts of information available at your fingertips—some of it good and some of it bad. It seems that the more amazing the information being presented, the higher the risk that it is bogus. Consider the email currently circulating the globe: “Mars Spectacular!" Since Mars is a bit closer, it will appear a bit brighter, and a bit bigger in a telescope, but in no way will it be as big or as bright as the moon! Mars is going to stay put, in its orbit, just as Earth is going to stay in its orbit for billions of years to come, unless something were to come by and knock it out of its orbit…Hmmm? Mars is almost 9 times as massive as the moon is, and at its closest approach to Earth it contributes a tidal force that is about .00003% that of the moon’s. Very small, indeed! For the planet Mars (diameter – 4076 miles/6794 km) to appear as big as a full moon, which is about .5 degrees wide, it would have to be about 467,000 miles (747,200 km) from us. That’s almost twice the distance between the earth and the moon. At that distance Mars would exert a tidal force (which is a function of 1/R3, where R is the separation of the two bodies) on the earth that is about 1.1 times that of the moon. So depending on the location of the moon relative to Mars, the tides could be more than twice as big if the moon and Mars were aligned on the same side of Earth, to almost nothing if they were on opposite sides of our planet, where the two forces would balance out. This tidal force would change direction as Mars swept by Earth, affecting the magnitude and duration of the tides. 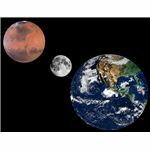 Mars would also tug on the Earth-moon system and could cause the moon’s orbit to change by some amount depending on the timing of the event. We would have a beautiful view in the night sky for sure, but more importantly, we would probably have some very high tides and more seismic activity that we would not have had otherwise! This would also apply to the moon, as Mars would play a tug-of-war with Earth over it. So, go out before sunrise for the rest of May, through June and into July, 2009, and enjoy the ruddy red dot that is Mars (along with brilliant Venus!). While you are looking at Mars rejoice in the fact that it is happily in orbit about our sun, and will be for many, many, many years to come. Oh! And the next email you receive, or Internet story you read that sounds way too amazing to be true—be a bit skeptical and check it out, do a bit of detective work on your own. After all, you have the Internet at your fingertips! Carroll, Bradley, W and Ostlie,Dale A. (2007). An Introduction to Modern Astrophysics, San Fransisco, Ca: Addison Wesley, pg 719-723.